Now all you UPPAbaby pushchair lovers out there can accessorise your beloved stroller with a snuggly-warm, water-repellent pushchair footmuff. The UPPAbaby Cozy Ganoosh has been designed especially to fit the entire range of UPPAbaby pushchairs. Even on the frostiest of toe-nibbling days, your little pumpkin will be kept as snug as a bug in this gorgeously stylish, fleece-lined cosytoes. 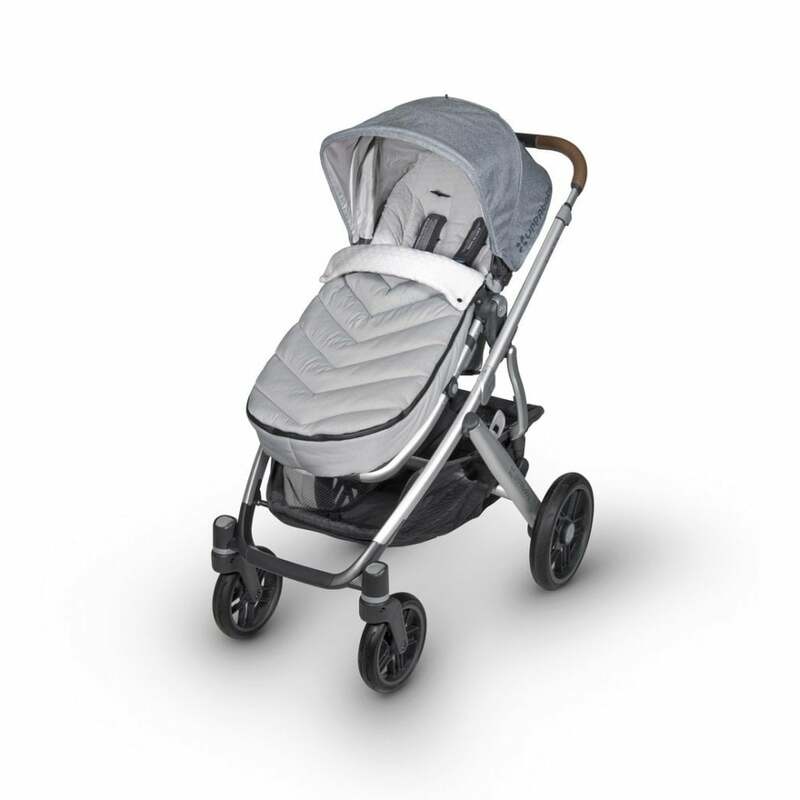 The traditional quilted design of the outer fabric makes this buggy accessory one that is understated, chic and will suit all colours of UPPAbaby strollers. Why should I choose the UPPAbaby Cozy Ganoosh Footmuff? The ultra-plush Cozy Ganoosh incorporates an elasticated hood, which can be simply rolled over the back of the stroller when not in use, and a full coverage neck warmer which poppers around the bumper bar if not needed. This clever cosytoes can be easily secured in place with the stroller's harness & fabric tabs that attach to the stroller frame, preventing any movement no matter how much your wriggling worm squirms. The Ganoosh boasts a windproof & water-repellent exterior, has a 2 way waterproof zipper and even has an interior foot barrier especially for shoes that have been splashing in muddy puddles! This fabulous machine-washable pushchair seat accessory is suitable for children from 6 months until they reach 85cm in height. Tested in the harshest of conditions, the UPPAbaby Cozy Ganoosh keeps little ones toasty warm and comfortable in temperatures as low as -29C! That’s pretty impressive! Suitable for all UPPAbaby pushchairs. Showing our 4 UPPAbaby Cozy Ganoosh reviews with an average rating of Excellent. Would you like to write a review? Your Review - Yes it's expensive, but it's REALLY nice, and fits the pram so perfectly, and is SO warm and cosy. Totally worth it in my opinion! Your Review - Good cosy footmuff. A friend had recommended the brand one as she had bought a cheaper one and it had been rubbish. I'm glad I went with this one. Even though we have the Pascal grey pushchair I went for Jake Black footmuff and it looks really smart and I think will last a long time. Your Review - I deliberated buying the Cozy Ganoosh over a universal footmuff, but I’m so glad I did spend the money. The quality is excellent and my eight month old absolutely loves it. He falls asleep all snug inside. It looks really stylish on my Uppababy Vista and I like the way you can have it 3 different ways depending on how cold it is. It is expensive, but worth the money. Your Review - overall a good item. Slightly too warm when it's not really cold yet, but winter is coming.